Christina Trevanion runs Shropshire-based Trevanion & Dean with business partner Aaron. She specialises in jewellery, silver, ceramics, glass and pictures. Christina is an experienced valuer and has worked in the industry for over ten years at Christies, Halls and Hansons. Established as a regular on daytime television, she’s a familiar face to antiques fans as an expert on BBC One’s Bargain Hunt, Antiques Road Trip, Put Your Money Where Your Mouth Is and Flogit! What are the current hot sellers in the auction room? Our trade buyers are looking for fresh-to-the-market pieces which are in untouched, original condition and that have been well made, what we would term an ‘honest piece’. Whether it be jewellery, porcelain, pictures or furniture, this applies to all the disciplines. The decorative market is looking for bright, unusual, decorative and, dare I say it ‘the quirky’. Anything really that is sympathetic to the modern interior and creates an eclectic ‘look’. We are certainly seeing a revolt against the trend for anything ‘greige’ that was so fashionable last year, its great to see people injecting colour and fun into their homes using saleroom purchases. The Chinese market is still buoyant and produces some surprises in the saleroom! What do you think are becoming the new investment items? Year on year we are seeing an increasing value in the wristwatch market, and I do not think that this market has reached its peak as yet. Good quality watches by well-known brands such as Rolex, Omega, Patek Phillipe, IWC etc are all brands which are sought after at auction and will continue to command strong prices in the market, especially if they have their original documentation and boxes. 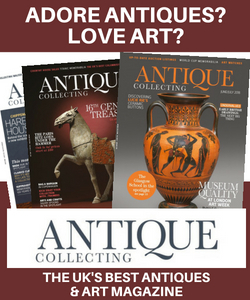 What antiques do you have at home? An eclectic mix of inherited family pieces and treasured saleroom purchases, I have two small children and so my 18th century teapot collection was packed away until they get a little older! I wish I had a crystal ball and could enlighten you! The market changes rapidly according to fashion and style and so what is ‘in’ this year and commands high prices, may be completely taboo next year and therefore of very little value. If you are looking for something to invest in I would suggest that you can’t go wrong if you look for things which are artisan made, therefore made in a limited number, that are of exceptional quality and, most importantly that you like and can live with. The industry has changed almost beyond recognition since I began my career in 1998. 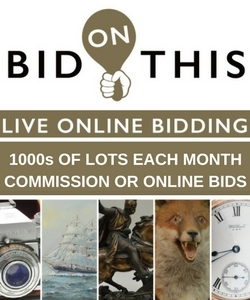 The advent of the internet and how auction houses use it to their advantage has resulted in a much wider awareness of the benefits of buying at auction, both for private and trade buyers. Although there are still some academic collectors around, the main market these days seems to be for items that create a certain aestheticism within the home, pieces are purchased for the ‘look’ that they create. If you’re buying from auction and cannot get to view a piece in person, all salerooms offer the facility of what we call condition reports, free of charge. You can request a condition report from the auction house directly on the lot/s that you’re interested in and they will contact you with a report on the item and what condition it is in. This is very useful if you are buying ‘blind’ – I once bought a chair (un-inspected, my own fault) it looked lovely on the photo, I got it home, sat on it and the back leg fell off – it was riddled with woodworm and ended up on the bonfire! If I had asked for a condition report it would (or should!) have picked this up and I would have steered clear. I’m not a person driven by the number of noughts on a price tag, I buy things I like and can live with in my home, regardless of value. I’d love to say the Koh I Noor, but I’d look a bit daft in the supermarket or on the school run wearing a diamond crown. 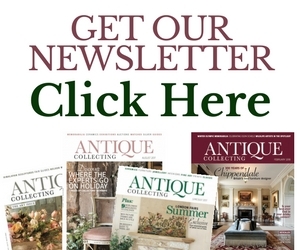 What are good antiques to buy if on a budget? It depends what you’re looking for, if you are looking to furnish your home I would suggest that you can’t go wrong buying brown furniture at auction at the moment. You can pick up lovely Georgian chest of drawers for under £200 and they will last longer than you or I. I am partial to antique glass, there’s nothing more beautiful than seeing cut glass twinkling by candlelight on a dinner table and it is crazily cheap to buy, pop to your local saleroom and see what they have to offer. Other than auction houses, which are my favourite antique stomping ground. My two favourite antique shops that I have ever been to and keep returning to, are The Store Yard, Portlaoise, Co Laois, Ireland and Odeon Antiques in Leek. Both offer a fantastic, ever-changing, eclectic mix of wares, but even better than that, for me it’s about the shopping experience and the customer service offered, The Store Yard offer the BEST homemade jam you have ever tasted!